I use reading centres in my class. One group reads with me and three to four other groups are working independently. I'm always looking for engaging reading activities that hold my students accountable and that are easy to manage. I started out as a grade three teacher, so I used comprehension books as one of my centres to help prepare students for the standardized reading test at the end of the year. I continued to use them in grade two because they involved reading, were easy to monitor and easy to assess. However, they are not engaging. As a replacement for my comprehension books, I decided to try Google Forms. That way it was still easy to monitor student progress but I could base the questions on real books, which are more engaging. Giving students choice on what to work on also adds to engagement. So I selected five books that I had mulitple copies of and put them in a "reading tub". On one day students read books from that bin for their centre work. On the next day, they log into Google Apps and select one of the books answer questions about. By using Flubaroo on the questions that are not long answer, I get a quick way to check student's comprehension. Flubaroo is a script you add to the Responses Sheet that is produced when you create a form. You can control which answers are graded and which are not. To make it easy for my students to access, I put the links to the forms on SchoolZone (under homework). I had the setting done so their username is automatically collected. However, students need to go into their Google Drive to "log into" Google Apps. Then they can access the forms. My students handled this step very well, but it can delay them if they forget. Remember to select "automaticall collect respondent's EPS username" or make it a required question for students to type in their names! I recently read a blog post that compared Educational Technology to a marathon. 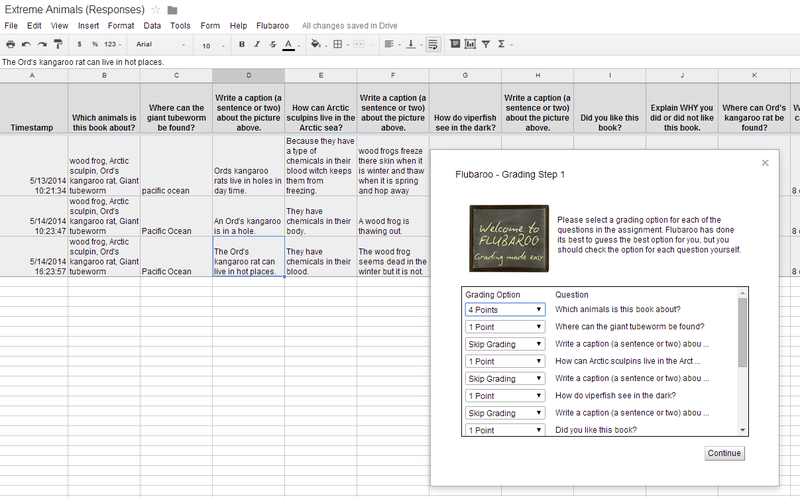 Using actual books in combination with Google Forms is going to be a marathon task. It'll be worth it but it'll be slow going. Creating a form for each book takes time. Again, here is where I think collaboration will help. So I've posted all the forms I've made for books on the Division One Collaboration Site For Educational Technology. I am going to be teaching an integrated science (about insects and the like) and language arts unit soon. I've been working on creating a number of forms to go with animal book sets.